A complicated relationship between our three leads threatens to drag them under and consume them from within. 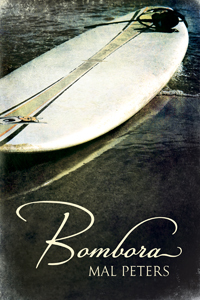 Bombora by Mal Peters, available from Dreamspinner Press. After a disastrous relationship with a married man leads to losing his family and his job, Phelan Price ends up in the small surfing town of Cardiff-by-the-Sea, California. It’s the perfect place to recover from a nervous breakdown—he even becomes good friends with a fellow surfer, Hugh, a mystery writer who has plenty of demons of his own. Life isn’t perfect, but Phel is starting to get back on his feet. Then Phel’s estranged lover arrives under the banner of a messy divorce, the circumstances of which he refuses to disclose, and throws their peaceful world into chaos. Phel’s shock is complete when the man he’s been trying to forget introduces himself as Hugh’s brother, Nate. As far as Hugh is concerned, this is as good as it gets: Nate completes their band of misfits perfectly, and the bond they develop through surfing seems strong. But he is unaware that, beneath the surface, Nate and Phel share a darker history than he could ever guess at—a riptide past that threatens to drag them under and consume them from within.